My bread(the one I baked) has air holes in it......and I thought I could never do that well I mean sort of......... In the month of November I have baked 3 breads, out of which 2 were Italian breads(didn't posted any of them). But I guess it's more easy to bake them than to document them. But I have to write a post for each of them, for my record, so later on if I need to, I can refer to my notes here. This time I decided to choose another recipe . After my first trial of Italian bread I did little research & decided that it's time to use biga. Now, what's biga? Biga is a type of pre-ferment used in Italian baking. Many popular Italian breads, including ciabatta, are made using a biga. Using a biga adds complexity to the bread's flavor and is often used in breads which need a light, open texture with holes. Apart from adding to flavor and texture, a biga also helps to preserve bread by making it less perishable. Biga techniques were developed after the advent of baker's yeast as bakers in Italy moved away from the use of sourdough and needed to recover some of the flavor which was given up in this move. Bigas are usually dry and thick compared to the French Poolish or a sourdough starter (source : Wiki). Here's the recipe, as usual I divided into half to make one loaf. Method : Before I start to write the procedure, I would like to say that making biga may sound complicated but it's really as easy as mixing flour & water. The only difficult part over here is that you have to start it a day before, it's a time consuming process as most of the time is spent on dough to rise & ferment. Making Biga : Just mix the ingredients for biga & knead it for 3-4 minutes. The dough or as it's called biga will be kind of very soft. Grease the inside of bowl with few drops of oil(or use cooking spray). Cover with plastic wrap & keep it at some warm place for at least 3 hrs. after that move it to the fridge. Next day after fermentation, biga will be bubbly & almost double. Make sure you take it out of the fridge at least half an hour before you decide to work on it(I took it out an hour before). 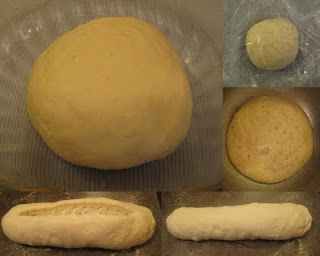 Like biga, dough is also easy to make, combine flour, yeast & water & knead it for 3-4 minutes. Coat the inner side of a big bowl & let the dough rest in it for 20 min. covered with plastic wrap. After resting period sprinkle the salt & add biga to the dough and mix everything together & knead for few minutes( I did it for 5 minutes), making sure that everything get mixed while kneading, Oil your hands to avoid stickiness. Note : It take little time to incorporate the salt into the dough this way, I'm not sure what difference it would make if salt is added in the beginning which would be easy, but I followed the recipe for that part. But I did added all the salt at this point, where as actual recipe is adding it in two parts. Actual recipe has a link for the video on how to knead which is really helpful for beginners like me. Cover the bowl with the dough tightly with plastic wrap & let it sit at room temperature for at least one hour. Uncover after an hour, fold the dough, one side to the other and top to the bottom & flip it over in the bowl(don't forget to use cooking spray/oil). Remember NO PUNCHING gently folding only. Again cover it with the plastic wrap & let it rest for another hour. Repeat step 4 after an hour. So in total the dough rest & rise for 3 hours. Now on a floured surface roll the dough to roughly 8" x 10". Then starting from either of the short side fold both the corners towards inside(roughly 2-3"). Now start rolling that pointed side, make a log. Put the seam side down & tuck the ends underneath(I lightly wet my finger with water & used it to pinch the sides & seam at the end of the log/roll). Transfer the loaf onto the baking sheet(sprinkled with corn meal). Cover loosely with plastic wrap & let it rise for another hour. Recipe suggests to pre-heat the oven to 500 degree F for 45 minutes, yes 45 minutes to the mark, that means it needs to be really hot, I did it for only 30 minutes(I guess it was hot enough). Once oven is ready, cut a 1/2" slit lengthwise in the loaf, leaving 2" margin on both sides. You really need a sharp knife for this, In my last trial after baking the slits were hardly visible, so this time I used kitchen knife & it worked perfectly. Bake for 10 min. at 500 degree F. Rotate baking sheet one half turn reduce temperature to 400 degree F & continue baking for another 30 minutes until loaf is golden brown(oven temperatures may vary, so I normally set my timer to little less time then it's asked for.....mine was done in total of 33-34 minutes). Note : when tapped on its bottom, a perfectly baked loaf shoul sound hollow. Look : It looked like a perfect artisan bread. Crust & Inside : It was really crusty from outside, given a choice I would really like to have little softer crust than what it had. It was more on the harder side I would say, I have to do little more work on that, if any body has any suggestion please drop a line. Now for inside, it was perfect, it had that taste & aroma of fresh bread and that chewiness and most important of all it had air holes, what more I could wish for. Serving Suggestion : We liked fresh warm bread with little butter & leftovers were eaten little toasted with butter. Storing : Actual recipe says you can freeze it also, but I kept few leftover slices wrapped in the foil in air tight box on the kitchen counter & used it next day. I loe making bread with Biga; discovered it abaou 10 year ago.If ever you are interested I have a grat recipe in Zaar. I intend to try this one next week.Bread it good! i love ciabatta breads..,,very detailed explanation..thnx..i guess its right..baking is easier then documenting the baking..
Nicely explained and bread looks perfect..
@Sage, I'll surely give try to your recipe sometime. @Malar..... definately, I guess this is one event no one can miss,ha..ha..
you describe so well !! the bread looks perfectly artsan..and must be having a complex flavor as the biga is slow fermented ...i would love to try this bread . i make many breads n buns with different combinations of flours n seeds , but always with fresh yeast n never tried prolonged fermentation...have to try it to know the flavor..
@sangeeta, I saw at your blog that you like to bake breads.....I've never used fresh yeast....go ahead & try this one i'm sure u gonna like it, but do tell me if u have any suggestions for making the crust little soft. Good one Spice and looks so crusty too. ! This has been on my to make list for a long time. Nice looking bread. Spice, to answer your question, I used egg products for decorations. I am the only person who doesn't like to use eggs in my place. If it is not egg as in egg in any dish/eatable, they don't mind. Plus it is easy to handle a cake baked with egg compared to egg less. It crumbles too quickly if you want to tort them into thin layers. Plus royal icing made without meringue powder is not very strong either. So, they break apart easily. Lovely bread.. I love homemade bread. The whole process and the aroma.. lovely!